However controversial a rail project is, is it a good idea to pull the plug after construction has already begun? Honolulu residents have that question to ponder from now until Election Day. The city’s mayoral election has become a referendum on its controversial rail project. Former Gov. 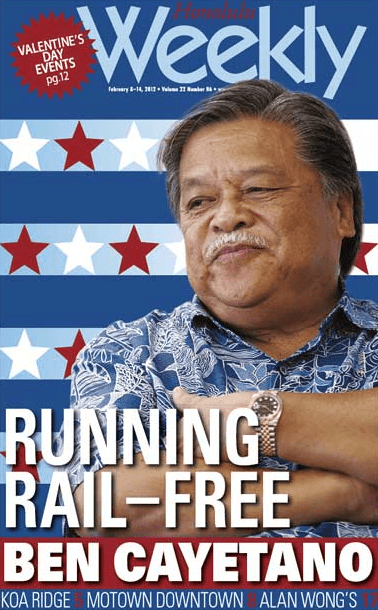 Ben Cayetano came out of retirement (and took a demotion) to save the city from building a light rail system in Oahu, passing through downtown, the airport, the state’s largest shopping center, and the proposed site of a new University of Hawaii campus. Pillars for the elevated track have already been built. If Cayetano had won 50 percent of the vote in the August non-partisan primary, the race would be over. His 44 percent is still a formidable hurdle for challenger Kirk Caldwell, a former state legislator who briefly served as acting mayor when the sitting mayor resigned to run for governor. Caldwell lost the job to Peter Carlisle, another rail supporter, in a 2010 special election. If Caldwell can win over the great majority of Carlisle voters, he could be victorious next month. Besides, August’s primary isn’t necessarily a precise indicator of how the general election could go, since turnout will likely be far higher in November. Cayetano’s counter-proposal includes bus rapid transit and new road capacity, including elevated express roadways and shorter bypasses. His platform‘s tagline says it all: “It’s time to get our city on the road to a better future” [italics added]. Cayetano says his plan would cost about 20 percent as much as the light rail system, and that it would take just six months to build (as opposed to 10 years for rail). But critics say it isn’t a sustainable solution to Honolulu’s traffic woes. While it’s hard to see the election through anything but a prism of the transit controversy, both candidates deny that it’s the only issue in the campaign. Cayetano says it’s about much more, while Caldwell, unfortunately, says it’s about much less. Compare those visionary lines with Caldwell’s claim, in an interview with Honolulu Magazine, that what he loved about being mayor was “dealing with things like taking away garbage, dealing with sewage, filling potholes, making sure your water comes on … making sure the grass is cut in the parks, bathrooms are clean in the public restrooms, all of those things. I love that stuff.” As for “legacy issues,” he named modernization of the sewer infrastructure. Even the rail system’s biggest supporter knows it’s a political hot potato. Fifty percent of Oahu residents would vote now to stop the rail project, according to a recent poll. When the rail project was approved by voters in 2008, it only won with 53 percent of the vote. Several problems have dogged the light rail project. Cost, as always, is one, although it’s being paid for with an already-approved excise tax, one-third of which will be covered by tourists, Caldwell says. Some voters also worry the elevated rail line will mar the cityscape. Another, thornier issue is that of burial grounds. Hawaii state law prohibits removing, destroying or altering any burial sites unless explicitly permitted by state and local burial councils. As suspected, archaeologists did find a bone along the proposed path of the rail line last month. At least two major burial sites along the route were already known about before the excavation. Cayetano warned that the city’s promise to re-route the line around any sites they might find was disingenuous. “They’re going to talk to the burial council and say, ‘Where can we put these bones, because we’re not going to move this column because it’s too expensive,’” Cayetano said. We’ll be bringing you more news about how transportation figures into the November 6 elections at the national and local levels. Got a hot contest in your area? Make sure we know about it – send us a note at tips@usa.streetsblog.org. The Honolulu Rapid Transit was a big “SHIBAI” from the start. http://www.youtube.com/watch?v=N1eqDrCrrx8 Kirk Caldwell and Mufi Hannemann wanted to plow on at any costs. The project started in 2006 at $2.7 BILLION for a 34 miles route. In 2010, the price rose to $5.3 BILLION for a 20 miles route. This ugly money black hole is estimated by all government reports to hit $7 BILLION. VOTE BEN CAYETANO to restore fiscal sanity. Honolulu doesn’t want or need this project. Put the money into fixing our roads instead. Railroad is for mainlanders and would spoil the character of our island. Only fools would accept a cost of over $250 million/per mile…and that is at the current forecast-ed cost. With the average overrun of 40% it is more like $360 million/per mile. The current rail plan does not even address commuting to and from Waikiki and more importantly the University of Hawaii. Also, there really is nothing “light” about using steel on steel technology!. Only fools would reject thier only solution. Harold: did you know there’s already been a railroad on Oahu? Ran over to Ewa. Another one ran all the way around Kaena Point. So your argument that it would “spoil the character of the island” is moot since there’s already been precedent. As for the elevated rail “marring the landscape”, doesn’t the H1 already do that? And wouldn’t Cayetano’s plan for “elevated express lanes” do so even more? Harold: Cars are the plague that mainlanders unleashed on the character of your islands. You need to see the real disease and take your islands back from the traffic, the pollution, the noise and the parking lots. I’m in Hawaii very often and love it. But I don’t want to spoil your paradise with my rental car, tying up more traffic and putting your islands’ residents at any more risk. Let me make the smallest impact possible on your way of life and take a seat on a train. Is it light rail? I thought it was an elevated automated system, like SkyTrain in Vancouver? Cayetano is crazy and dangerous. This is a really important vote. If Cayetano wins, Hawaii will just keep gettin g more expensive and more polluted, and millions of dollars — including federal money — will have been wasted. The Honolulu rail line is, by any measure, the best designed urban rail project in the United States. It would be *extremely* popular. Bus Rapid Transit is a road-building tool. BRT is about maintaining and extending automobility. Always has been, always will be. Honolulu isn’t building light rail like everybody else. It is building an antiquated elevated heavy rail system. That’s what people want stopped! BOTTOM LINE: Cayetano lost the mayoral election, 55% to 45%. The project is moving ahead in compliance with the public’s wishes as displayed in this election and several others.